Entryway is a place that easy get cluttered with shoes, clothes and bags… Sprucing up the entryway is definitely one important thing on my to-do list, it’s the first thing you see when you enter your home and the last thing you see when leaving – and probably one of the easiest spaces to makeover. 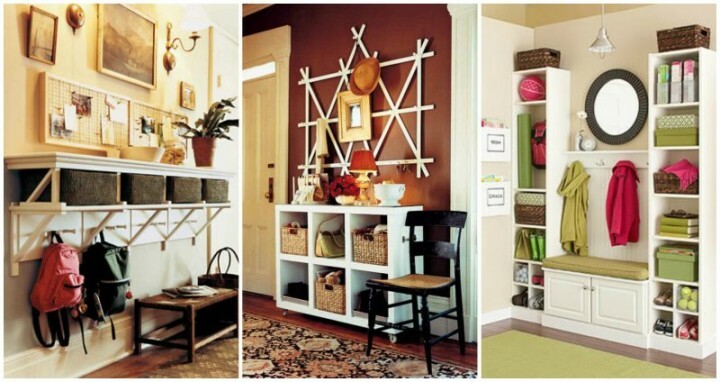 Whether you have a dedicated mudroom, small coat closet or just a little open space, this inspiration colloection here contains ideas to creative storage solutions to help get your entryway in check with these best 30 DIY Entryway Ideas for Your Home upgrade. Entryway Key Throw Table: You guys requested it, so today Josh is here to share instructions for this beautiful DIY entryway table. We’re loving it in the space. It’s been fun to restyle it each week with fresh flowers and thrift finds. Entryway Mantel : Place a mental to hang clothing and place small stuffs onward. Narrow Hallway Built-in Wall Mudroom: The built-in narrow hallway mudroom looks so neat and organized for a entryway storage. Family command center idea: Don’t spend the first days of school hunting down school supplies and shuffling through important papers. Get your life organized before the school year begins! Entryway Storage and Organizer: Organize your entryway with a simple storage locker for jackets, shoes and other stuff that clutters that area. It’s a handsome organizer that you can build in a day.